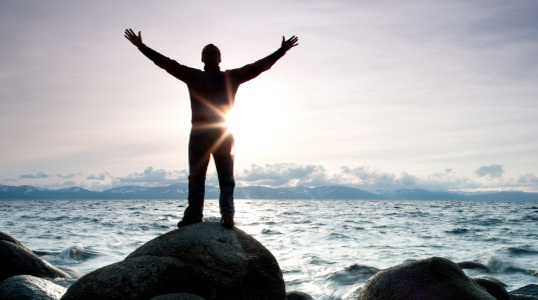 Dedicato strives to provide the best addiction treatment available. Dedicato Treatment Center utilizes a humanistic approach that includes empirically sound and proven evidence-based practices, to help our patient’s overcome their addictions and manage any other co-occurring mental health disorders that they may have. 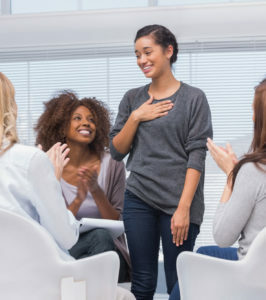 Moreover, our treatment will use motivational interviewing, which is a non-judgemental and non-confrontational counseling technique that attempts to give the patient autonomy and help increase his or her self-awareness. These strategies help our patients to envision hope and a better future for themselves and find the intrinsic motivation necessary to achieve it. Click on any of our treatment options below to learn more. Cognitive Behavioral Therapy (CBT) is a treatment modality and major aspect of our programs used for addiction treatment and recovery. It is very common for individuals struggling with substance use to experience destructive and negative thinking or thought patterns. Not recognizing these thought patterns as unhealthy, they seek treatment for depression or other external influences. Dialectical Behavioral Therapy (DBT) is a cognitive behavioral treatment that was originally developed to treat chronically suicidal individuals diagnosed with borderline personality disorder (BPD) and it is now recognized as the gold standard psychological treatment for this population. In addition, research has shown that it is effective in treating a wide range of other disorders such as substance dependence, depression, post-traumatic stress disorder (PTSD), and eating disorders. Trauma and substance abuse often go hand-in-hand. For most, trauma happens first and then addiction develops. There are many times when people turn to substances to cope with the emotional aftermath of trauma. But addiction can also lead to trauma – from driving intoxicated and getting into a car crash to crime or sexual violence that takes place while under the influence. Whatever way they develop; many patients need help with both. Q. WHAT IS AN INTENSIVE OUTPATIENT PROGRAM? Intensive Outpatient Treatment (also known as IOP for “Intensive Outpatient Program”) is a primary treatment program recommended in some circumstances by a clinical and medical assessment. IOP may be recommended for those who do not need medically-supervised detox. IOP can also enable people in recovery to continue their recovery therapies following successful detox, on a part-time yet intensive schedule, designed to accommodate work and family life. Start rebuilding your personal life and mending your important family ties right away, while you live at home and participate in intensive outpatient treatment. With the Intensive Outpatient Treatment program, you are able to establish a foundation for long term recovery support in your local community right from the start of your treatment, instead of waiting until you return from living away in a rehab center. What factors must be addressed to prevent relapse? Damage or disability on this list could have resulted from the drugs and addiction, or they could be qualities or abilities that were always lacking in the person. Either way, they are weak points that can and will cause upsets and setbacks. 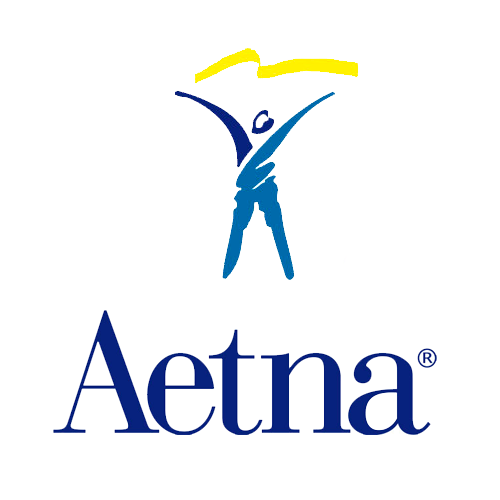 In 1997, the World Health Organization (WHO) further defined life skills as “abilities for adaptive and positive behavior, that enable individuals to deal effectively with the demands and challenges of everyday life.” Certainly this definition applies to those susceptible to drug or alcohol abuse. When life gets too difficult, a person without these abilities too often seeks relief in drink or drugs. At Dedicato Treatment Center we will help you or your loved one develop a relapse prevention plan that includes healthy coping skills and the identification of your individual relapse warning signs both psychological and environmental. Moreover we will help you develop a plan that includes connection to social support networks and people who will help you maintain your sobriety (e.g., 12 step meetings AA, NA,CA, Sponsorship, or other etc.). 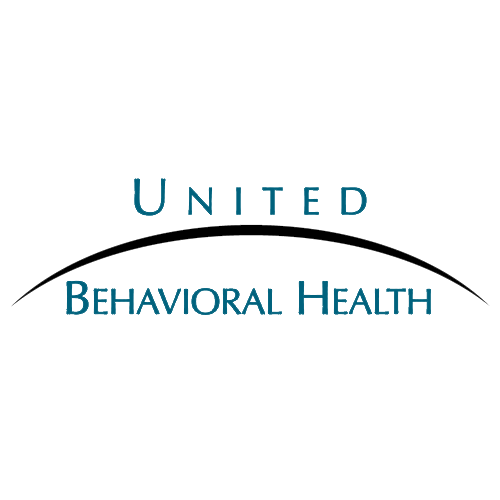 Psychoeducation group is designed to educate our patients about substance abuse, and related behaviors and consequences. This group presents structured, group‐specific content, often taught using lectures and video tape. Our group leaders will facilitate discussions of various material. Our Psychoeducational groups provide information designed to have a direct application to our patients’ lives—to instill self‐awareness, suggest options for growth and change, identify community resources that can assist patients in recovery, develop an understanding of the process of recovery, and prompt our patients using substances to take action on their own behalf. While our psychoeducational groups may inform our patients about psychological issues, they do not aim at intrapsychic change, though such individual changes in thinking and feeling often do occur. Purpose. The major purpose of psychoeducational groups is expansion of awareness about the behavioral, medical, and psychological consequences of substance abuse. 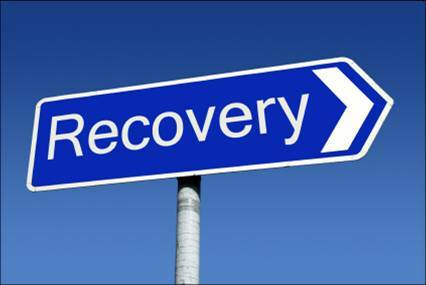 Another prime goal is to motivate the patient to enter the recovery‐ready stage. Our Psychoeducational groups are provided to help our patients incorporate information that will help them establish and maintain abstinence and guide them to more productive choices in their lives. 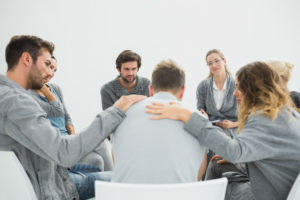 These groups also can be used to counteract our patients’ denial about their substance abuse, increase their sense of commitment to continued treatment, effect changes in maladaptive behaviors (such as associating with people who actively use drugs), and supporting behaviors conducive to recovery. Additionally, they are useful in helping our patient’s families understand substance abuse, its treatment, and resources available for the recovery process of their family members. Our fitness Center offers a full size professional total body universal machine, dumbbells, core balls, elliptical machine, resistance bands, recumbent bike, weight bench, and floor mats. This can be a good fitness activity because it does not put too much pressure on the joints. Our pool is large, heated, and has a water fall. This is a very good exercise for people who are newly sober because it does not involve too much effort. Most often our patients start off with some gentle stretches. Our certified Yoga instructor will help our patients understand and benefit physically, mentally and spiritually from Yoga. Part of recovery is starting to participate in the regular activities that most people enjoy in a sober lifestyle and are usually cast aside when in active addiction. To help reintroduce those type of activities while at Dedicato, we offer a weekly night out as a group for some healthy and fun entertainment. These activities may include bowling, movies, dining out, miniature golfing, etc. We offer clinically managed residential detoxification (e.g., non-medical social detoxification setting). This level emphasizes peer and social support and is intended for patients whose intoxication and/or withdrawal is sufficient to warrant 24-hour support. It has become clear that detoxification involves much more than simply medically withdrawing a patient from alcohol or other drugs. Detoxification, whether done on an inpatient, residential, or outpatient basis, frequently is the initial therapeutic encounter between patient and clinician. Irrespective of the substance involved, a detoxification episode should provide an opportunity for biomedical (including psychiatric) assessment, referral for appropriate service, and linkage to treatment services. At Dedicato Treatment Center we assure you that our initial assessment will determine if the patient needs a higher level of care (e.g., a medically monitored inpatient detoxification). Individual therapy (sometimes called “psychotherapy” or “counseling”) is a process through which patients work one-on-one with a trained therapist—in a safe, caring, and confidential environment—to explore their feelings, beliefs, or behaviors, work through challenging or influential memories, identify aspects of their lives that they would like to change, better understand themselves and others, set personal goals, and work toward desired change. People seek therapy for a wide variety of reasons, from coping with major life challenges or childhood trauma, to dealing with depression or anxiety, to simply desiring personal growth and greater self-knowledge. Our patients and therapist work together from the start of treatment and meet 2 times per week until the end of treatment. 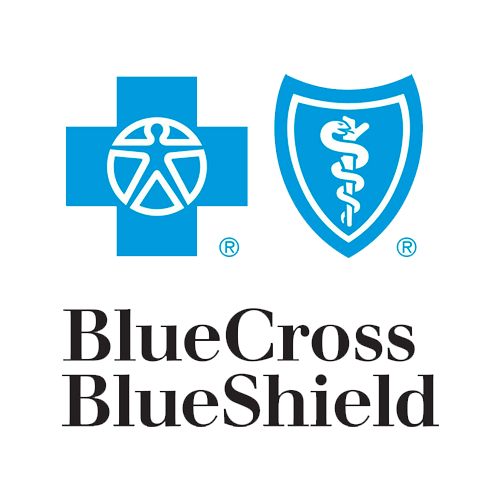 Parallel treatment of your mental health and substance use disorders by the members of a highly trained treatment team. Acknowledgement of the importance of psychotherapeutic medications, such as antidepressants or anti-anxiety meds, in the treatment of any co-occurring disorder(s) you or your loved one may be experiencing. A supportive approach to therapy that reinforces self-esteem and builds self-confidence instead of confronting you with negative and aggressive statements. An inclusive treatment strategy that brings partners, spouses, children and other household members into therapy for individual counseling, group meetings or education. 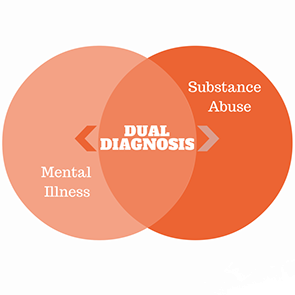 Getting a Dual Diagnosis: To receive a Dual Diagnosis, you must meet the criteria for a mental health disorder as defined by the current version of The Diagnostic and Statistical Manual of Mental Disorders. Published by the American Psychiatric Association, the DSM-5 is the guideline our mental health professionals use to make the appropriate diagnosis. To assure accuracy and effectiveness in “diagnosing” our clinical team of licensed and certified mental health clinicians and addictions professionals meet weekly to discuss and conceptualize each patient case, so we can collaborate and develop a treatment plan with our patients. Art therapy is a form of expressive therapy that uses the creative process of making art to improve our patients physical, mental, and emotional well-being. The creative process involved in expressing one’s self artistically can help our patients to resolve issues as well as develop and manage their behaviors and feelings, reduce stress, and improve self-esteem and awareness. 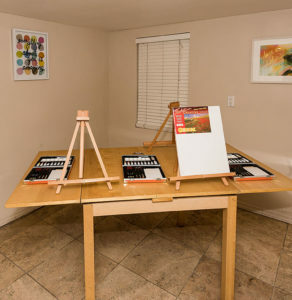 You don’t need to be talented or an artist to receive the benefits, and our Art Therapist will work with you to dive into the underlying messages communicated through your art, which will aid in the healing process. Art therapy can achieve different things for different people. It can be used for counseling by therapists, healing, treatment, rehabilitation, psychotherapy, and in the broad sense of the term, it can be used to massage one’s inner-self in a way that may provide the individual with a deeper understanding of him or herself. Art therapy, sometimes called creative arts therapy or expressive arts therapy, encourages our patients to express and understand their emotions through artistic expression and through the creative process. Art therapy is a form of expressive therapy that uses art materials, such as paints, chalk and markers. Art therapy combines traditional psychotherapeutic theories and techniques with an understanding of the psychological aspects of the creative process, especially the affective properties of the different art materials. Art therapy at Dedicato Treatment Center involves the creation of art in order to help our patients increase awareness of themselves and others. This in turn may promote their personal development, increase their coping skills, and enhance their cognitive function. It is based on personality theories, human development, psychology, family systems, and art education. Our Art therapists is trained in both art and psychological therapy. For family and friends of drug or alcohol addicted individuals, addressing the addiction is one of the most difficult aspects of helping the addicted person seek treatment. Often, over time, daily family involvement has only managed to enable the addict. Family members frequently do not know how to bring up the issue of addiction therapy, and opt to ignore the problem for fear of pushing their loved one away during a confrontation or intervention. These are legitimate concerns, and while families should understand that approaching their loved one should be a gentle and supportive process, they also need to understand that most patients seek substance abuse treatment because of positive family involvement and intervention. Each family is different, and the best way to approach family involvement with addiction therapy will differ with every person. 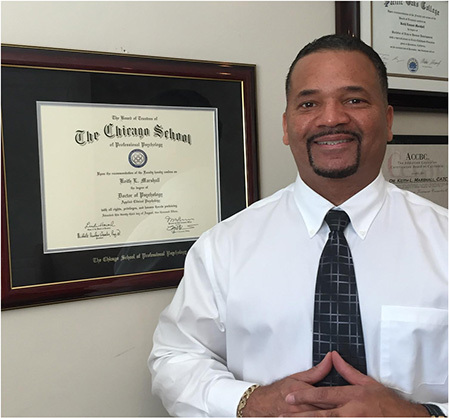 Our licensed and certified clinicians are trained to work with drug and alcohol addicted patients and their families. It is important to understand that the family dynamic in drug and alcohol addiction is incredibly powerful, and that addressing an unhealthy imbalance in communication is your first step in moving your family toward a journey of recovery and self-discovery. Each week offer family education group in addition to “scheduled” individualized family sessions. When considering and involving family in the treatment process our primary purpose is to help each member of the family gain an understanding of the disease of addiction and how to facilitate the process of family reintegration. The purpose of group therapy is to assist each individual in emotional growth and personal problem solving. Group therapy encompasses many different kinds of groups with varying theoretical orientations that exist for varying purposes. All therapy groups exist to help individuals grow emotionally and solve personal problems. All utilize the power of the group, as well as the therapist who leads it, in this process. Many individuals who suffer substance abuse find themselves in a state of “isolation” and often feel alone. The group process will help the addict to learn to gain healthy independent and interdependent skills. 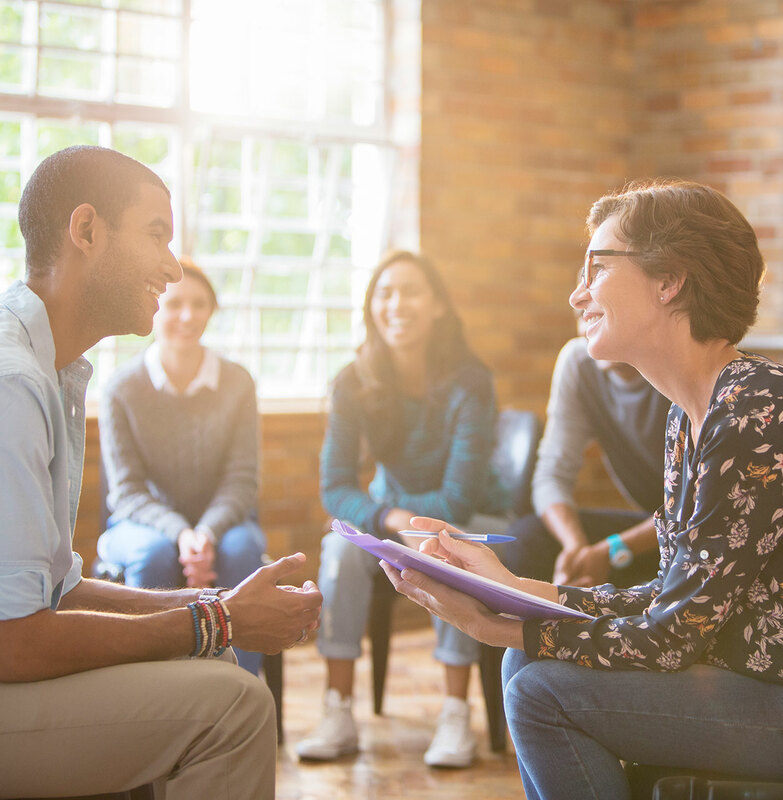 Unlike the simple two-person relationship between patient and therapist in individual therapy, group therapy offers multiple relationships to assist the individual in growth and problem solving. All patients come into therapy hoping to decrease their suffering and improve their lives. Because each member in a therapy group is inevitably at a different point on the coping continuum and grows at a different rate, watching others cope with and overcome similar problems successfully instills hope and inspiration. New members or those in despair may be particularly encouraged by others’ positive outcomes. Universality, a common feeling among group therapy members, especially when a group is just starting, is that of being isolated, unique, and apart from others. Many who enter group therapy have great difficulty sustaining interpersonal relationships, and feel unlikable and unlovable. Group therapy provides a powerful antidote to these feelings. For many, it may be the first time they feel understood and similar to others. Enormous relief often accompanies the recognition that they are not alone; this is a special benefit of group therapy. An essential component of many therapy groups is increasing members’ knowledge and understanding of a common problem. Explicit instruction about the nature of their shared illness, such as depression, past trauma or substance abuse, is often a key part of the therapy. Most patients leave the group far more knowledgeable about their specific condition than when they entered. This makes them increasingly able to help others with the same or similar problems. 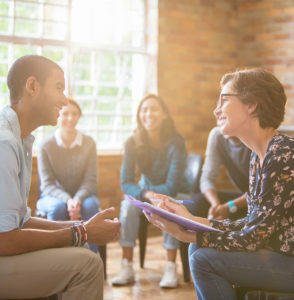 Group therapy offers its members a unique opportunity: the chance to help others. Often patients with substance abuse problems believe they have very little to offer others because they have needed so much help themselves; this can make them feel inadequate. The process of helping others is a powerful therapeutic tool that greatly enhances members’ self-esteem and feeling of self-worth. According to Yalom, social learning, or the development of basic social skills, is a therapeutic factor that occurs in all therapy groups. Some groups place considerable emphasis on improving social skills, for example, with a peer preparing to leave treatment after multiple relapses, or among bereaved or divorced members seeking to date again. Group members offer feedback to one another about the appropriateness of the others’ behavior. While this may be painful, the directness and honesty with which it is offered can provide much-needed behavioral correction and thus improve relationships both within and outside the group. There are few places in the world where you’ll find more honesty, courage, and support than in a 12 step meeting. It’s one of the most amazing experiences you can have. 12 step groups are not what you see on television or in the movies. 12 step groups are an important resource of recovery for two reasons. First, they’re effective. Millions of people have recovered through them. Second, they’re free and universally available. Almost every country, every city, every cruise ship has a 12 step group. There are many other kinds of recovery supports, including doctors, therapists, addiction counselors, and treatment programs. But how they work is obvious. How 12 step groups work is not as well understood. You can decide if you have an addiction. You can go to a 12 step meeting and hear other people’s stories and decide if there are any similarities between their stories and yours. You can overcome some of your denial about addiction. You see that addiction can affect anybody. Good people, with good jobs, good families, and a sense of humor, can have an addiction. You may know that intellectually, but you need to believe it. Everybody likes to think that they’re special. But addiction is one of those times when it’s comforting to know that you’re not alone. You meet people who are going through the same thing. The idea behind 12 step groups is that you feel stronger when you belong to a group of people who are doing the same thing. Everybody’s first reaction to addiction is to deal with it on their own. Addiction is an isolating disease. 12 step groups give you the chance to reach out and ask for help. You believe that recovery is possible. You see that other people have recovered from addiction, and you develop confidence and hope that you can change your life. The people who recovered didn’t do anything special. They just followed the few simple principles of 12 step groups. If you follow those principles, you can recover too. 12 step meetings are a resource. You can ask other people who’ve been in the same boat you’re in how they handled certain situations. You can ask them if what you’re going through is normal. Some days you’ll have an overwhelming urge to use, and it’s good to know that other people have gone through the same thing and how they dealt with it. One of the fears many people have is that their life will be smaller or less interesting without drugs or alcohol. 12 step groups give you a chance to meet people’s whose lives are just as interesting and in many cases bigger and more fun now that they’ve stopped using. Most addicts have difficulty sharing their emotions, partly because they’re afraid nobody will understand them, and partly because they’re afraid that they’ll be criticized. So they bottle everything up inside, which makes them want to use even more. The people at a 12 step group won’t judge you because they’ve have heard it all before. They’ve done it all before. They know that you’re not crazy because of the things you do when you’re using. You’re addicted. I can promise you that this will happen. After you’ve been clean and sober for 6 months or 12 months (it usually happens around those times), you’ll feel stronger than you’ve felt in years. That’s when the voice of your addiction will tell you that you can control your use this time. This time will be different. This time you’ll know what to do. 12 step meetings give you the chance to hear the stories of the people who’ve just come into the program, or the stories of the people who’ve relapsed and just come back. They will all tell you the same thing. They all felt they could control their use. If you could control your use, you would have done it by now. Addiction is a disease like heart disease or diabetes. You would never think that your heart disease is gone once you started to feel better, and that you could eat anything or not exercise without suffering more heart disease. 12 step meetings remind you of that idea. You have a safe place to go. 12 step meetings are a safe harbor when you want to be out of harm’s way. If you’ve had a bad day you can go to a meeting and spend a couple of hours knowing that you won’t be able to use. By the end of the meeting you’ll almost certainly feel better and more motivated for recovery. 12 step groups are a source of hope, strength, safety, and guidance. They are not based on shame and labeling yourself in a negative way. Instead they encourage you to take responsibility for your life and to realize that you can stop your addiction. 12 step groups encourage you to recognize that an addiction is a medical disease and that you are powerless to change your genetic makeup and the way that you respond to alcohol. But they also encourage you to realize that you have the power to change other parts of your life so that you don’t relapse in the future. 12 step groups encourage you to take a look at your life and see how you got into trouble in the past so that you don’t fall into the same traps in the future. 12 step groups encourage you to ask for help, whereas your addiction encourages you to avoid help. 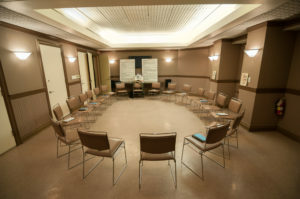 At Dedicato Treatment Center we connect with and utilize the 12 step groups as another method and resource for recovery for our patients. It enables our patients to gain pro-social and positive connections to others when they discharge the program. Attendance and involvement with 12 Step groups has proven success rates. Although we do not base our program on the 12 Step model we encourage our patients to stay open-minded to involvement with others in the 12 Step process and utilize this resource as measure to help avoid relapse.